S/S April 17th. OPEN HOUSE April 22nd 2-4pm. Offers Accepted April 24th evening. Welcome to 360 Centennial, featuring one of River Heights most popular layouts, the centre hall plan. 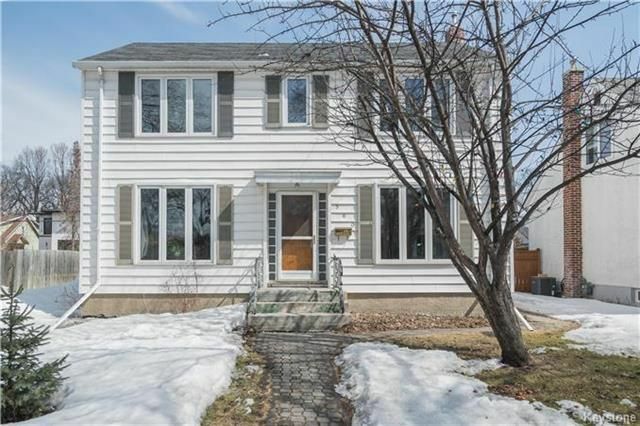 This two storey home is 1408sf, it has four bedrooms (all together on the upper level), two recently refreshed bathrooms and loads of charm. Entering the front door on the main level of this home you are greeted by loads of natural light and the semi open concept floor plan is the perfect place to entertain, or relax with family after a long day. Throughout the home you will find the original hardwood flooring, and updated windows. The lower level of this home is partially developed with a spacious family room, a three piece bathroom, and the laundry/storage area. Outside a large, fully fenced yard features a separately fenced in garden area, stone patio and a single detached garage with room for 2 more cars. Located in River Heights and close to great schools, shopping, parks and transit! Call today!